I’d never been in an airport before everything opened. Perhaps that’s not true, but if I had, it was certainly because of a connection and not because my flight was so early. 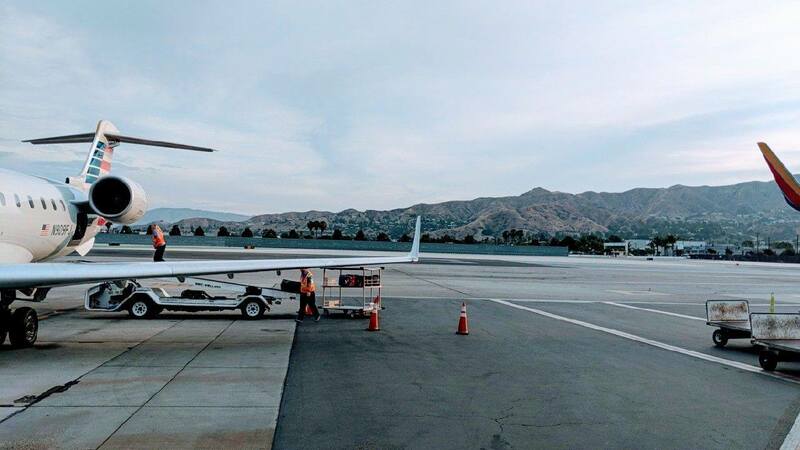 When we showed up at Hollywood Burbank Airport to return home, there was nobody at any of the check-in stations, the restaurants were still dark and locked up tight, and even the automated kiosks said they weren’t ready for the day to start. It wasn’t long before the check-in clerks arrived, but when we got to the top of the security line, a gate was down there too. All of this punctuated something we were already acutely aware of: how blasted early it was. That’s the way with air travel, though, and as we’d hit no speed bumps (ignoring a bit of turbulence) on the journey out, we were quite content to sit through the extra waiting before our flight. The down time was a welcome thing after all the activity of the preceding weekend. We’d flown across the country (Burlington, VT to Simi Valley in Southern California) to attend a wedding. A quite close college friend of mine had been trying hard to get back to Vermont, but to no avail. A group rate at a fancy hotel and a once-in-a-lifetime ceremony were just the thing to reunite us, albeit briefly. While it was not my first time in California, I hadn’t been that far south in the Golden State before (and it’d been over a decade since I’d been to the West Coast anyway). My memories of the first two times are hazy at best, as for one I was about five, and the other was after driving literally from coast to coast. Thus, as we drove from the airport to our hotel, the state’s nickname really started to make sense to me. We all know the American Southwest is mostly desert, but I never put together that that meant SoCal was littered with mountains crisped to a nice golden-brown. They’re absolutely beautiful in a completely different way than any of the mountains in the Appalachian chain, those East-Coast mountains with which I’m most familiar. It was even more eye opening for my girlfriend, who is a Vermont native. We left Vermont during a heat wave, which means it was upwards of ninety-five degrees with plenty of humidity to go around. When we landed (and once my weather app had updated), my phone told me that it was 112 degrees outside, with “plenty of sunshine.” I braced myself as we exited the building to await our luggage at the open-air baggage claim, but to my (mild) surprise, I wasn’t covered in sweat by the time we were picked up. The difference is in the humidity; yes, it’s still quite hot, but because it’s not sticky, we can tolerate higher temperatures for longer. You can trust me; I hate the heat. It’s why I moved to Vermont for five consecutive winters. I didn’t do much that weekend that you could also do, unfortunately. Dinner with the bride-to-be (who I knew prior) and her groom (who I met that night), and then wedding things the next two days. Simi Valley does have a Presidential Library—Ronald Reagan’s, to be precise. Relaxing by the hotel pool in the SoCal sun was wonderful, and coming from the East coast, there are a wealth of restaurants that you simply don’t see. We only got the chance to try two, but Del Taco is nothing short of authentic (and therefore marginally superior) Taco Bell. There was one right by our hotel, complete with 24-hour drive through. The other new (to us) restaurant is called Islands and is a surfer/Hawaiian themed dine-in number with a burger selection that’s out of this world. They even provide the option to substitute a turkey or veggie patty on any burger (a feature not every restaurant has), so both my (vegan) girlfriend and I ate quite well. The wedding itself was beautiful. Summer in Southern California is (for real) a great time for an outdoor wedding, especially if that wedding is as the sun is setting. The ceremony ended just before the sun really committed to setting, but after the low vineyard walls had cast their shadow over those assembled. Fans and parasols had been provided, and thank goodness, as these tools were just the thing to keep us comfortable in that heat. I’m not ashamed to admit that weddings always make me cry. At least, all the weddings I’ve been to for people in my generation have. The look in their faces as they proclaim their everlasting love before each other and their closest loved ones always gets me, and as my parents are nearing their thirtieth anniversary (and my mother’s parents are still together after fifty), you might say that I believe in the institution, which helps. It also helps that it tends to be people I’m close to who are getting married, so I’m more receptive to their happiness. It’s also fun that people let loose at weddings in a way they normally can’t—or won’t. A couple more glasses of wine than usual, perhaps. Dancing is another thing people will do at weddings they won’t normally do anywhere else, and it makes for a lot of fun for a lot of people. Weddings, especially Christian ones, tend to follow traditions and so have a familiar rhythm, made individual in the details. There was one piece this weekend, though, that I’d never seen before. The bride and groom each took off one shoe, sat back to back, and then were asked questions by the host from a list prepared by the bridal party. The questions were things like “Who’s the better singer? Who’s the better cook?” They’d hold up the shoe representing their answer. It was cute when they both said each other; it was funny when they both said themselves. Usually they agreed, though, and that, to me, is a very good sign. I couldn’t take as much advantage of the bar as I’d have liked to, as we had a very early flight to catch the next morning. One of the first leaving the airport, apparently, as we arrived before many of the airport employees. We’d woken up that day prepared to do a lot of waiting, so it wasn’t a big deal—more of a novelty than anything else. The rest of our travels that day were also smooth sailing. We were only on one flight that arrived late, and it was delayed after it was already in the air. Also, it was the flight just before our longest layover, so that kind of worked in our favor. Thankfully, we hadn’t been on the other side of the country long enough to fully adjust to the time difference, so we were able to slip right back into our everyday lives, albeit a bit overtired. Up next, we’re going back to Vermont to do more fun, affordable things around Burlington. Both articles I have slated to research are (technically) outdoors, and they’ll both be about my first time doing a thing. Stay tuned, folks, and in the meantime, don’t forget to have fun. Very nice account of your trip.